• Grate fresh ginger into the mixture -- Yeah, right. I'm sick, remember? Anyway I'm sure as hell not running to the store for fresh ginger. So how about this: Shake a little powdered ginger into the cup. • Microwave for two minutes, or until steaming hot. 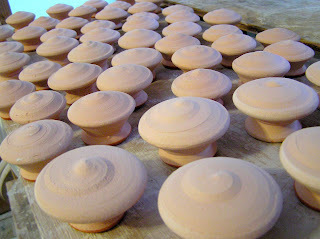 These knobs are part of a special order, destined to be cabinet & drawer pulls in Virginia. I've got two firings coming up: a stoneware firing the first weekend in February, in which the knobs above will be fired; and, returning to my roots a bit, a soda firing shortly thereafter. The soda firing represents a turn in my body of work, and is related to the changes that have been going on in the wet end of things. I look at some of these pots and I just can't think of a glazed surface that would suit them. I mostly fired atmospherically as a graduate student, and I still like the more dynamic surface that results. It also seems to be more related to the fire, and the process. Since I do have access to a soda kiln, (thanks Watershed! ), it seemed like a good idea. It's Martin Luther King Day, so I get an extra studio day this week. I have to use it to unload the bisque; Unfortunately it is only about 2 degrees outside. Fun City. Something new has been happening in the studio. Have you ever seen that bumper sticker that reads, "Since I gave up hope I feel much better"? Well, in a way I gave up hope. Probably only temporarily; I've given up hope before. Here's how it happened; For two years and more I've been part owner of a store in Hallowell, Maine, called Kennebec River Artisans. It's a great store; we carry lots of wonderful made-in-Maine artwork. I'm pleased to help other artists have a place to show and sell their work, but of course, part of the plan was that I would sell my work, too. And I have, just not in the numbers I hoped. Or anything close to my hopes. 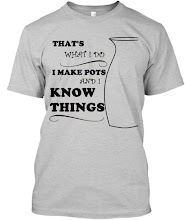 There are potters who do very well at KRA, but their aesthetic is very different than mine. I've spent two years trying to make pots that I thought would sell , while maintaining my aesthetic. After a truly crummy Christmas season (for me; not the store, especially) I recently gave up trying to make pots that will sell. This is amazingly liberating! The pots that I have made since the beginning of the year are the best I've made in a long time. To the right, I've posted some photos of the pots drying. And, another thing; the sculpture bug has returned! That muse has been absent for probably five years; I thought she was gone for good. This abstract Steam Iron was the result this week.